Lemon Dream Cake | FoodGaZm.. Mix the cake according to the package directions and pour into a 9x13, greased dish. Add spoonfuls of the lemon pie filling onto the top of the batter. The can of filling I bought happened to be 22 oz. rather than the 15.75 recommended in the recipe so I just didn't use all of it. 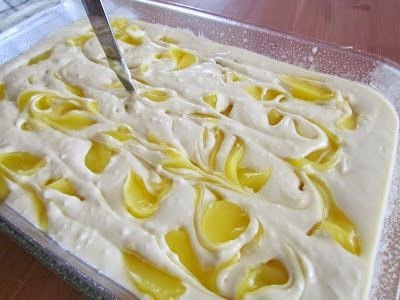 Next, using a butter knife, swirl the batter so the lemon filling is mixed in slightly. Bake at 350 degrees for 35 - 40 minutes, or until cake is done. The lemon filling will sink to the bottom during baking. That's OK! It's supposed to do that. After cake is baked, cool completely on a wire rack. Next, in a large mixing bowl, combine 1 can of lemon frosting and the the entire container of Cool Whip (I forgot to take a picture of this step). I set the Cool Whip out for about 30 minutes or so before mixing so it was softer and easier to combine with the frosting. Spread mixture over cooled cake and refrigerate until chilled (we ate it after chilling for 30 or 40 minutes).